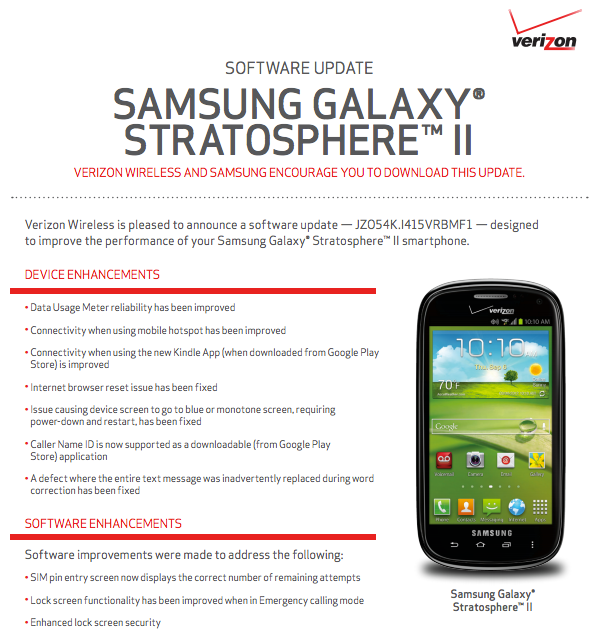 Back in March of this year, the Stratosphere 2 from Samsung on Verizon’s network received a major update to Android 4.1. With this new update, which is set to begin rolling out today, a lot of the bugs that were in the Jelly Bean build are getting squashed, along with a couple of feature additions. For example, a nasty bug that rendered your display useless and with a blue monotone look has been fixed, as well as a reset bug that plagued the stock Internet application. About five other major fixes are included, so if you have noticed any of those problems on your device, you will want to pick up this update. As for enhancements, the SIM pin entry screen will now display the correct amount of remaining attempts (oh gee, that’s nice), lockscreen functionality has been improved and there is now enhanced lockscreen security, whatever that means. If you have a Stratosphere 2, go grab the update through the Settings>About Phone menu. If it’s not there yet, keep trying over the next few days. Google Schedules Press Event With Sundar Pichai for July 24 - Android has to be the Topic, Right?